Following a survey of the student body asking what kind of dormitory facilities they would most like to see, what is now known as the Social Dorms were designed. The ground was broken for the Social Dorms June 16, 1962. 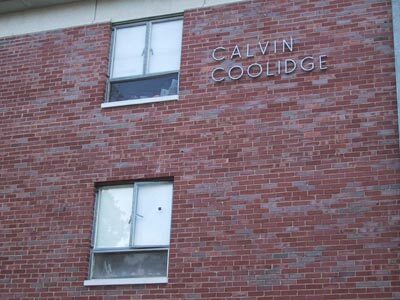 Calvin Coolidge Hall was named for Amherst's representative in the canon of Massachusetts Governors and American Presidents, a member of the Class of 1895. 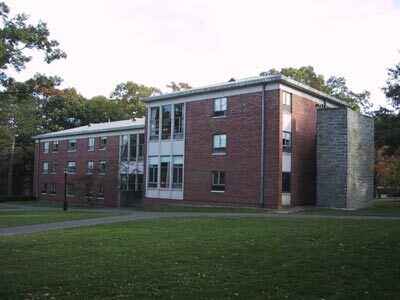 The building, designed by O'Connor and Kilham, was completed in 1964, but remained "C Dorm" until it was officially named in January of 1966. (Archives & Special Collections, Buildings and Grounds Collection, box 18, folder 83) (Photos taken 12 October 2001).